It's time to Fill the Cookie Jar! The theme for April is Easter or Spring. I really wanted a cookie to capture the feel of both. I finally decided on a cookie I have wanted to try for some time. 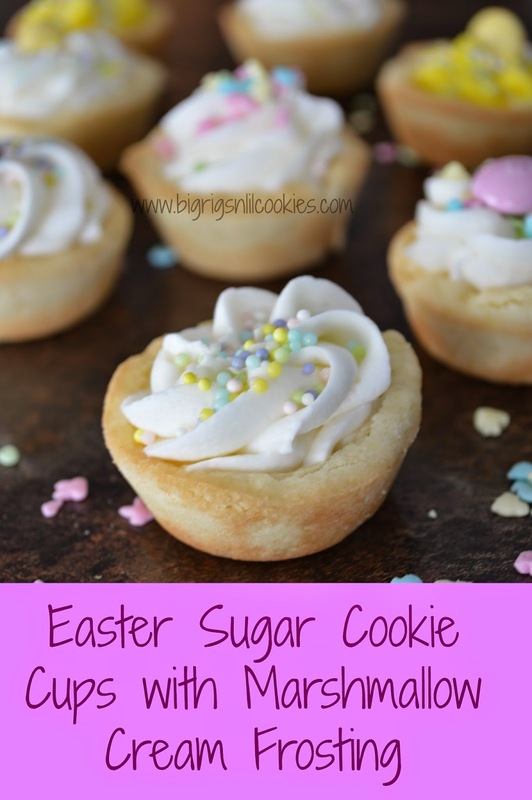 "Sugar Cookie Cups"! I see so many people make these cute adorable little cups, but I never knew what I would fill them with until very recently. 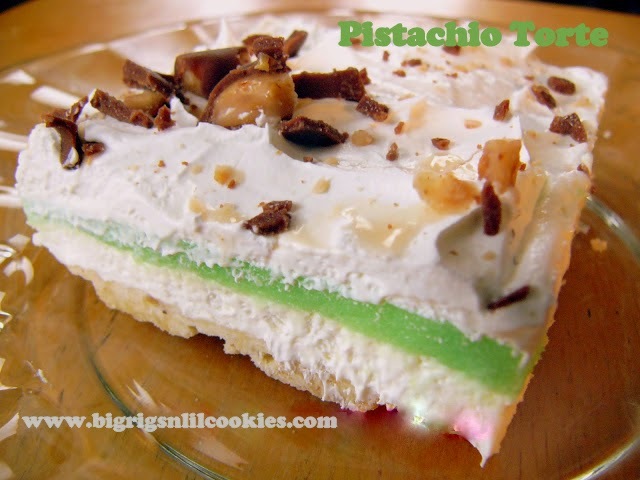 One of my blogging buddies, Mandy at "South Your Mouth" had made a marshmallow frosting to use for sandwich cookies. This would be perfect for Cookie Cups! These little cookie cups are perfect! The frosting reminds me so much of Peeps, marshmallowy goodness with lots of sweetness. That's like Peep's right? They are an Easter candy that it's been around as long as I can remember! And you really could top these with just about any favorite Easter candy. These will keep for about a week in an airtight container, however I really liked the flavor best during the first couple of days. The marshmallow flavor really was perfect, but as the cookie cups sat a couple days, the butter flavor took over. Not a bad change, but I liked that marshmallow sweetness! You don't have to have any special tools to make the cookie cups. I made them with a gadget, and without. My preference was to use my "Mini-Tart Shaper" because I had lots more room for frosting in those cups. The cups I did by hand, turned out fine, just not as much room for frosting! 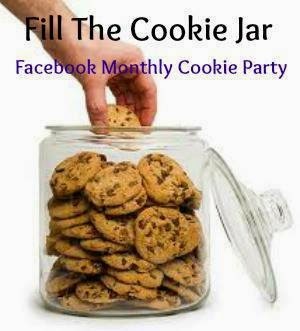 If you are interested in joining Fill The Cookie Jar group on facebook, fill out the form that can be found at Fill The Cookie Jar. Each month we bake a different theme for the cookie. We bake, we share and we enjoy our cookies! In large bowl, blend butter, shortening, sugar, eggs, and vanilla. In medium bowl, combine flour, baking powder, and salt. Add dry ingredients to butter mixture, mixing well. Chill dough for one hour. Preheat oven to 400 degrees. In non-stick mini muffin pan, put half tablespoon of dough in each cup. Dip one end of mini-tart shaper into flour, then press into cookie dough cups, gently twisting, removing when dough is just below edge of cup. If you do not have a tart shaper, simply press dough into bottom of cup, and press up the sides. Bake for 7 minutes, or until edge is just starting to turn golden. Let cool in pan for 5-7 minutes, then remove from pan and cool on wire rack. While cookies are cooling, in large bowl whip together marshmallow creme, butter, and vanilla extract on medium high speed. Mix until fluffy. Add half of powdered sugar, and milk, mix until combined. Add remaining powdered sugar, whipping until creamy and fluffy. If frosting is to thick, add milk as needed. Add food coloring if desired to some or all frosting. You can use a piping bag to pipe the frosting into the cups, which I did for the swirl, but you could also use a ziploc bag and just snip the corner off. I had a blowup in the middle of these and spooned the frosting into a couple, and they looked just as adorable. Garnish as desire with sprinkles, candies, whatever! Colored coconut would be fun too! My homemade cookie cups have never turned out this perfect! These look so festive and beautiful! These are so adorable! They're not only perfect for Easter, but would be great for a tea party. These are so dainty and pretty! The challenge would be to not eat too many. Happy Easter! How delicious and festive. I've never made cookie cups, I think it's time. Your recipe looks easy enough and the frosting, oh how yummy. A great holiday treat. Happy Holiday! These look amazing! I love he pics and colors on these yummy cookie cup! I hope you have an amazing Easter my friend! SUPER cute! i can think of so many places where these would be an appropriate treat. plus, the very idea of a marshmallow creme frosting is just outstanding--well done! and happy easter! I need to get one of those mini-tart shapers so I have more room for frosting, especially this yummy marshmallow frosting. Oh my I want some now. These look awesome! I would love for you to share at this weeks Happiness Is Homemade Link Party! Happy Easter! Happy Easter. Oh my, this looks so fun. :-) A perfect Easter cookie, so pretty. These are so cute! What a great Easter cookie! I pinned :-) this looks like something Atticus will love!